I can name a few fashion faux pas here. Available now on the PlayStation Network from Ludia Games is television’s most exciting hour of fantastic prizes, The Price Is Right: Decades. PlayStation 3 owners, come on down as you are the next contestants! It’s time to guess the price that players should be willing to pay for this particular title. Now place your bids! Now there isn’t much to complain since you’re basically pressing the X button to choose and O button to skip. However, there are a few aspects where it does feel awkward. For instance, while placing bids, it would have been more convenient if you can just hold the d-pad to scroll through the numbers rather than pressing constantly. In addition, spinning the big wheel with the analog stick feels quite stiff. Because there isn’t much innovation in the controls for this game, it becomes essentially a point-and-click session, which doesn’t allow players to feel immersed in the game show experience. Growing up with The Price Is Right, I remember getting all excited hearing Rod Roddy telling contestants to “come on down!” But with the announcer coming across as average and easily forgettable, we get the opposite effect. The contestants look just as plain and ordinary as those featured in Ludia’s other titles, like Family Feud: Decades. And if you look at the audience in the background, you’ll notice that they’re clapping in unison. In addition, the small video clip describing the prize to bid shows heavy compression. Unfortunately, Ludia has fallen short not only in giving a genuine feel of the TV show but also in keeping contestants from falling asleep with its content. As a contestant you initially enter Contestant’s Row, where you and three others must guess the price of the item that’s being shown. If your bid is the closest to the actual price without going over, you proceed to the Pricing Game. This time, you are on stage trying once again to guess on the right price in one form or another. 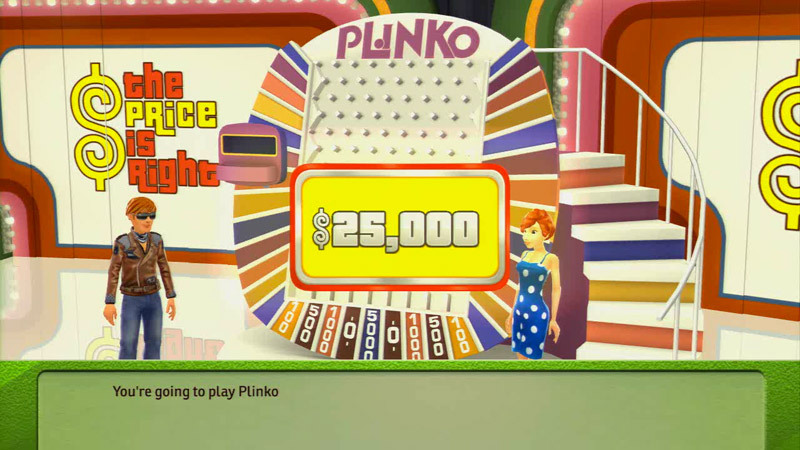 For instance, in the classic Plinko, you must determine which of the two parts of the price is incorrect in order to gain chips, which you’ll use on the Plinko stage to land on the prize money. There are also other games, such as the Dice Game and Gas Money, which you participate in during different sessions. No matter the outcome, you’ll move on and spin the big wheel with the aim of ending up with the number closest to, but not exceeding, 100. If your opponent’s number is lower than yours, you move on to make the Showdown Showcase to make the final bid against your opponent on a bunch of expensive prizes. You can choose to guess first or skip and take a chance on the next series of prizes. If your bid is closet to the retail amount without going over, you win them all! What makes The Price Is Right: Decades a sweet deal is how you’re able to jump straight into the Pricing Game that you have played previously. So even though the single play through can be as short as 10 minutes, the fact that there are other games you can unlock each time around is a big replay incentive. As the name suggests, The Price Is Right: Decades takes you across various sets played from 1972 to 2011. Not only are the stages different, but so are the prizes that you need to guess on. So if you want to get an idea of what the economy was like during different time periods, have a go at this game. Playing with up to three other players via local or online is a bit different. Everyone is participating simultaneously in every event, which speeds up the process but takes away from its authenticity. Bonus points are given during the whole ordeal and are tallied up in the end to determine the winner. Whether you’re playing on your own or in a multiplayer session, the game time can vary depending on how long it takes for contestants to place their bids. The Price Is Right: Decades overcomes its shortfalls with its charming and enjoyable content. For this PSN title, $9.99 is a fair price (and the correct bid). In the spirit of The Price is Right, I’m offering a code for the person that can come the closest to guessing how many Achievements I have unlocked on my Xbox 360 profile (without going over)! Post your guess in the comments section below and include your @Twitter name since this contest is for Twitter followers only. I’ll pick a winner tomorrow (April 17th) around 6 PM EST so you have until then to post. One entry per person, and remember, you’re guessing number of achievements, not Gamerscore. I used to watch The Price is Right Lol.